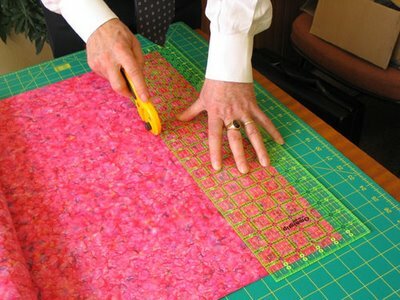 We begin an irregular series of articles by Geoff on patchwork and quilting tips with two short tips for rotary cutting. We’ll gradually introduce you to members of The Cotton Patch team over the coming months. If you have problems with your ruler moving when rotary cutting try this simple solution of putting your little finger over the edge of the ruler. This will act as a stop and resist the pressure from the rotary cutter. Only use your fingers and thumb to press on the rule not the flat of your hand. Another solution is to use Invisigrip (Ref. 8526). Invisigrip is a clear non-slip material that is applied to the underside of rulers and templates. It is easy to apply and does not obscure the markings. When you want to apply pressure it prevents rulers from slipping but slides easily when no pressure is applied. Before cutting always ensure that the blade is free to rotate. This will not only increase the life of your blade but also ensure that your rotary cutter is not acting like a knife and cutting into your rotary mat. A UK family run patchwork and quilting shop. This blog keeps you up to date with news, views and the latest products and changes to our website. Haiti Quiltathon Update - 90 Quilts Made! V and A - Quilts 1700-2010 - One Not to Miss!